Contact us and if we can organise what you want – we will do it ! 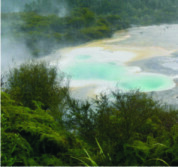 Rotorua is known as the Birthplace of Tourism in New Zealand and has a lot more to offer than paid attractions. 1) A visit to Te Puia including a hot cafe lunch, optional cultural performance (at no extra charge) guided tour / or self explore this area, including the Whakarewarewa Thermal valley and The Maori Arts and Crafts institute. Our first stop is to see the Lady Knox Geyser which erupts daily at 10:15am. Do you want some more time in Rotorua to see one or more attractions, grab a little extra sleep, visit Hobbiton or soak one last time in a spa and still visit Waitomo Caves?. With FlexiToursNZ you can. You will travel through Rural NZ landscape from Rotorua to the Waitomo Caves ( approximately 1 hour and 50 minutes) On arrival you will join a guided tour of the caves, conducted by a local guide – the highlight of which is the boat ride along the Waitomo River where you have the opportunity to see the myriad of glow worm lights that make up the Glowworm Grotto. 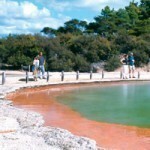 Visit Wai-O-Tapu or Oarakei Korako before travelling to Lake Taupo, the largest crater lake in the Southern Hemisphere.